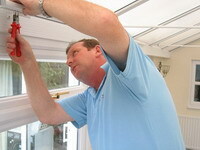 Fit-ex is the only national company dedicated to curtain fitting and blind fitting. Our image, of smart uniforms and liveried vans, sets us apart from every other curtain and blind fitter: we wear smart uniforms and drive liveried vans. 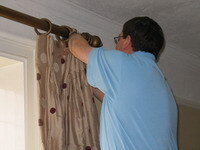 We fit for curtain makers and interior designers, providing a nationwide curtain and blind installation service. 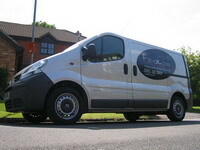 Fit-ex also supply corded curtain tracks, wood and metal poles if required. A professional measuring service is available for all types of window treatments, from bay windows to conservatory blinds. Fit-ex operators can install any hardware, with confidence, from any manufacturer: Silent Gliss, Kirsch, Integra and made to measure poles. Merrick and Day company director, Rebecca Day, one of the country’s top curtain makers and publishers in the interior design industry has have spoken up for Fit-ex, she says “Professional window treatments come in infinite variations and, as more and more companies and private individuals recognise the benefits of interior design, the greater the demand for professional curtain and blind fitters that truly understand the design process”. “A professional window treatment can cost several thousands of pounds and as well as making a room more attractive, can also assist with light control and sound insulation, but the way a window treatment is fitted can make or break a project. The industry is simply crying out for fitters that understand the intricacies of curtain and blind design and who can install curtains, blinds and pelmets to a high quality, professional standard”.